Ernie Kovacs must have had an inkling that his viewership on the half-hour comedy-variety show he did late mornings on NBC in 1955-1956 would include children. Why else would a puppet show have been a staple of the program’s regular sketches right from the start? Kovacs had certainly been no stranger to the mid-morning time slot, as that’s where his CBS show Kovacs Unlimited had been from 1952-54. Fan mail he and Edie got during that show’s run surely informed him about this. The Kapusta Kid in Outer Space followed the terrestrial and interplanetary exploits of the Kapusta Kid (who spoke with a severe lateral lisp), his sidekick Albumen (a horse-like character with a dopey voice), and O’Brien (a monkey who spoke with a Chico-Marx-Italian accent). Among their adventures were travels to a square planet where they encountered the wrath of Bruce, the funnel monster (a funnel with two eyes and movable mouth). Kovacs had already been doing a continuing episodic science fiction sketch in 3-minute installments on his ABC radio show already, entitled Space Commuter. The sketch, which I’m assuming was sprinkled around the 3 hours Ernie filled with spinning records and other bits, concerned the adventures of Ord W. Crimbon, a floorwalker in a department store on the moon, and his robot pal Gregor. The Kapusta Kid (“kapusta” is Hungarian for “cabbage”) featured puppets by Larry Berthelson, who got onscreen credit on the episodes that have “Kapusta Kid” segments. There is not a lot to be found about Berthelson’s puppetry work online, aside from the fact that he founded the Pickwick Puppet Theater in New York, and worked on some other TV shows in the 1950s and 1960s. Some years ago, the Kapusta Kid puppets came up for auction, and the listing and photos for them contained something unusual. Along with Kapusta, Albumen, O’Brien and the funnel monster, there was an Ernie Kovacs puppet. The Kovacs puppet had a small rubber tube coming out of the bottom of it as well. As I watched screeners of the 75 (give or take) surviving episodes of the NBC morning show when making my selections for the first Ernie Kovacs Collection box set for Shout Factory, I kept looking for that Kovacs puppet. There were a whole bunch of Kapusta Kid segments, but Kovacs never made a cameo in space. And then I got to the April 23, 1956 show. Every episode of the Ernie Kovacs Show features Edie Adams singing a musical number. And on this particular episode, she is introduced, and begins singing Cole Porter’s You’re The Top standing near what looks like a large TV set with the screen missing. 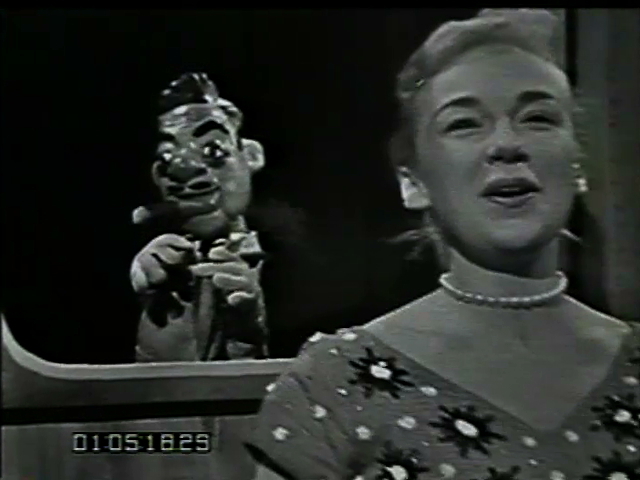 During the song, puppet Ernie appears and listens to Edie sing. They interact a little during the song, and at one or two points, his cigar puffs out some smoke. At the end of the tune, Ernie himself pokes his head out from below. I took some screen grabs from this and sent them to Rick Spector of Stairway to the Stars memorabilia. He’d won that auction, and we’d been in touch by email (I forget how), and I now had a positive ID on the puppet. 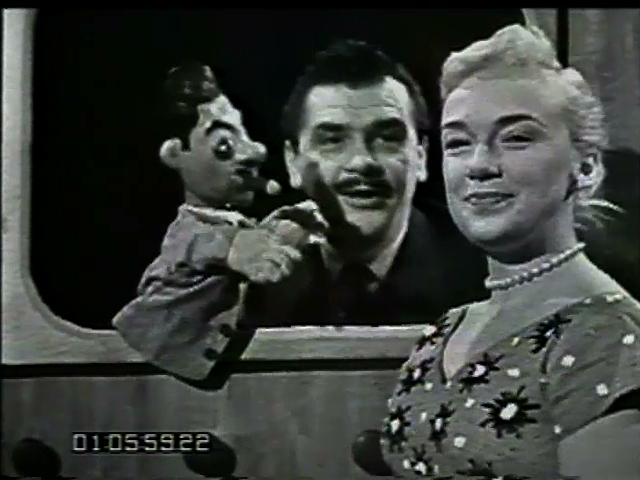 The Ernie Kovacs puppet does not make an appearance on any other of the surviving NBC Ernie Kovacs Show episodes, and would most probably have been built special for this one use. What the occasion was, we don’t know. Edie’s birthday had been a week prior to this episode, so maybe…? It’s been a while since I watched this show, but my recollection is that Edie is surprised to see that Ernie was the one operating the puppet when he pops up at the end. As most of the songs came with a licensing price tag that just wasn’t in the budget for the DVD box set, all the songs Edie or Peter Hanley or Matt Dennis sang that weren’t p.d. were removed. If Boccherini had written You’re The Top, this sweet little moment would have been on the DVD. If you know more about Larry Berthelson, I’d really like to hear about him. He seems to have been an important part of the puppeteering scene in New York in the 1950s and 1960s, the way Bil Baird was, and Berthelson’s fine work and career deserves to be better known.